Sthaviravāda (Sanskrit. Chinese 上座部) literally «Teaching Of The Elders», was one of the two main movements in early Buddhism, the other being that of the Mahasamghaka. «The Elders» referred to Buddha 500 immediate disciples who had attained Arahantship (Enlightenment), they held the First Council, and unanimously decided not to modify any of Buddha Vinaya and Dhamma. The two groups separated during the 2nd Buddhist Council at Pataliputra around 350 BCE. The Shtaviravada were the proponents of an orthodox understanding of the Buddha’s teachings, but the Mahasanghikas seem to have been more liberal and represented the majority, hence their name. 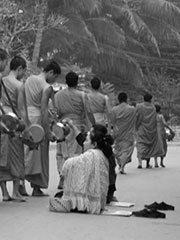 The Sthaviravāda faith survives today in the Theravāda tradition, but «although they share the same name (Thera and Sthavira being the Pali and Sanskrit forms of the same word meaning «elder»), there is no historical evidence that the Theravada school arose until around two centuries after the Great Schism which occurred at the Council of Pataliputra» («Oxford Dictionary of Buddhism, Damien KEOWN, 2003). Keown, Damien. (2003). Oxford Dictionary of Buddhism. ISBN 0198605609.